I feel like the proud parent of two children. My elegant girl is a contemporary romance, the winner of 15 book awards. My boy is a teen fantasy, winner of 7 book awards. Each book is written under a different pen name. The success of one does not affect the other, because they live as separate entities out there in the world. Just like two separate children. I ran a free book promotion for "Looking Glass Friends" and the novel hit Amazon's free book best-seller list. Hmmm... perhaps it's time to relaunch this novel, originally published in 2016. This is a crucial step. 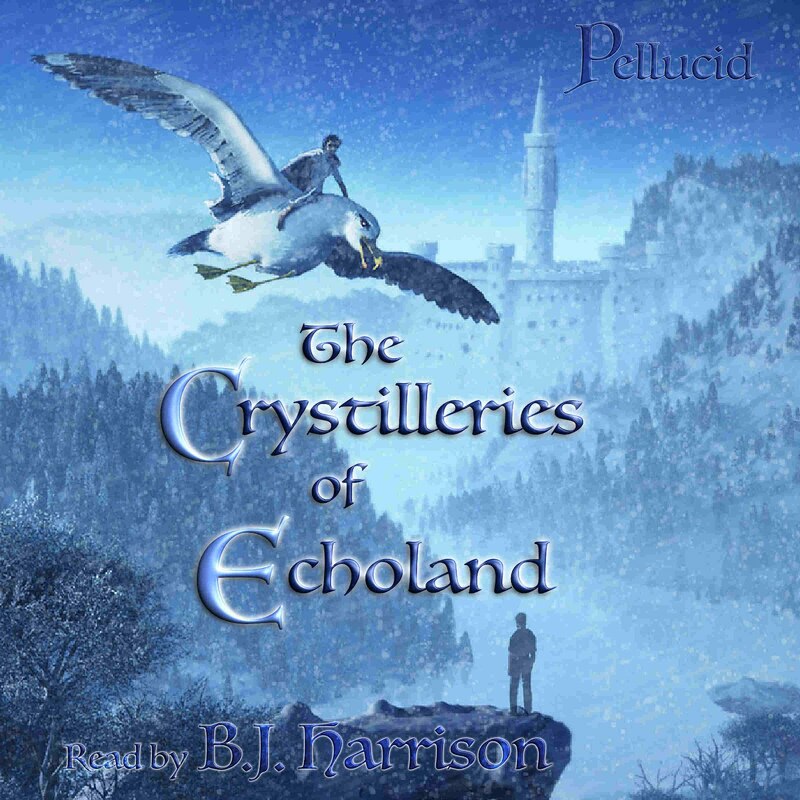 I warmly recommend this community of readers to all authors. Your purchase of the review package goes towards maintaining the site; the reviewers do not receive payment but are called "volunteer reviewers". More people will discover your book. The community will begin to discuss the book on their forum. You book reviews will appear on the site. If readers like the cover, they can share it on Pinterest. If readers like the review, they can share it on Facebook and other social media sites. You can request that the reviews be posted on Amazon, and the reviewer might choose to do so, writing a new, short version for Amazon. Reviewers will likely list any typos they came across. This has been enormously helpful to me in perfecting the book. As you read the reviews, you will come to see your novel through the fresh eyes of readers. You may discover errors you'll want to change. It's an enormous boost to see your book appreciated by many readers. Once your book has many reviews, you can choose to use the site's Book of the Day promo, to back your Amazon free book promo. You will likely hit Amazon's free best-seller list, and your book will be downloaded by thousands. I've tried advertising with several venues, but with my small budget I find that Facebook offers me the best results...under limited circumstances. The ad must be well targeted. I begin by selecting the location, age and interest carefully. Then as data comes in on how the ad is performing, I tweak the age and demographics. I include a "buy now" button with my ads. Without this button, Facebook ads do not lead to external link clicks (or very rarely). Even if people who visit my Amazon book page fail to buy the book, they seem to add it to their Amazon Unlimited list, because the book's seller ranking is beginning to improve. I'm about to test this ad with "The Crystilleries of Echoland". 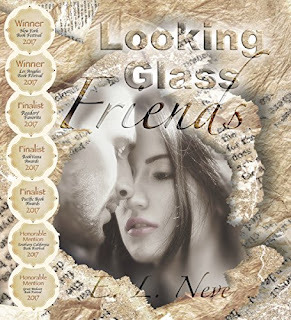 If successful, I will definitely proceed with an ad for "Looking Glass Friends" once enough reviews come in. Best of luck to you with your books! This weekend I tried a free Amazon promo for the first time. 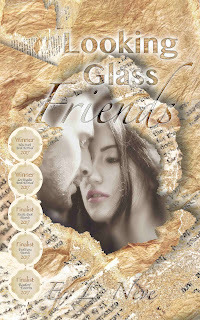 I listed my contemporary romance (more a literary love story, really), Looking Glass Friends. It was the first time I tried this promotion, and the results were surprising. 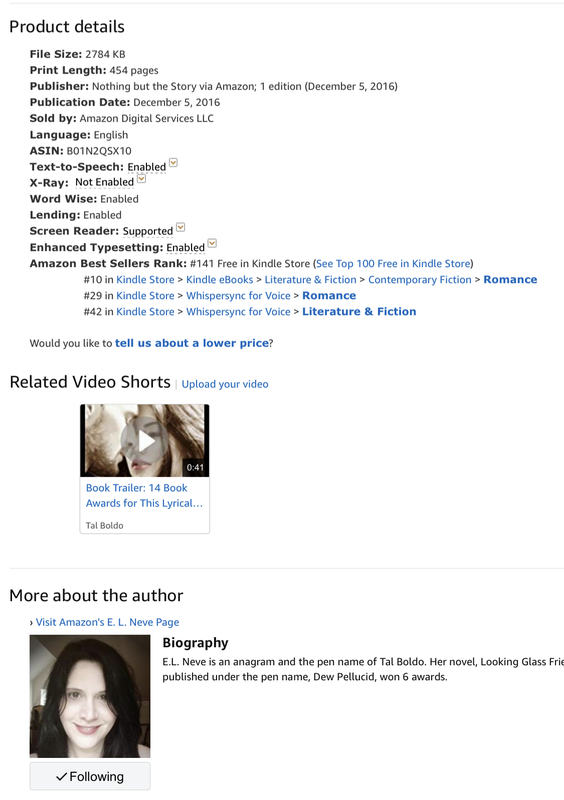 In fact, the book reached #9 in Free Contemporary Romance, made it into the fiction list and reached #135 in ALL free Kindle books (of course, I forgot to take a screenshot of this ephemeral moment). In all, Looking Glass Friends was downloaded 1, 368 times and two audiobooks were sold as well. From my, admittedly, limited experience, these were excellent results, of which I am very proud. All the traffic was funneled through this simple Facebook ad. It was the "Buy Now" button that made all the difference. I see that the button doesn't show here, but it was there when the ad was live on Facebook, and it enabled Facebook users to click their way directly to buying/downloading the book with no intervening steps. This, coupled with the number of awards the book has won, made it super-easy to get Looking Glass Friends, while the awards vouched for the story's quality in lieu of reviews. In my experience, Facebook users do not tend to spend money, but they are very supportive of creative ideas, and when something is offered for free, they will participate willingly. 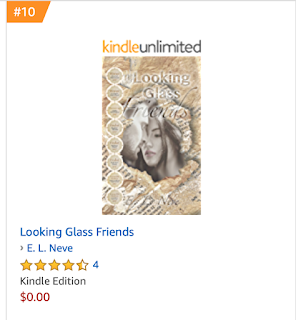 Once Looking Glass Friends made it into Amazon's top seller pages, I am sure downloads were generated that way as well. I am now following the advise of another author and trying Amazon ads to see if the momentum of sales can be maintained even in a small degree. 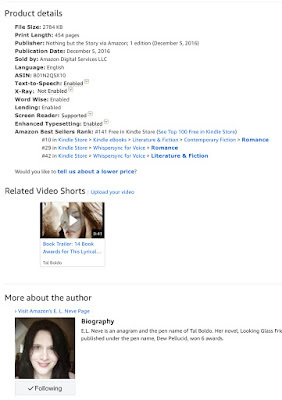 I notice already that Looking Glass Friends is being read on Amazon Unlimited, which helps its sales ranking. But the true test is to see if readers are willing to take a risk on my unknown novel, despite its only having 4 reviews at this time. Time will tell if I did right to lower the price from $5.99 to $2.99. As for all self-published authors, every step is an experiment. But this time the experiment worked, which feels great. I hope other authors find my experience helpful. This painting by the inimitable, Danielle Richard, faces our wide bedroom doorway, welcoming us back from sleep each morning. This is my second poem in the series, Poems for Paintings, published under my pen name, E. L. Neve (award-winning romance author). I wrote the music with Garage Band and recorded my poem under my real name, Tal. I hope you find the video soothing. You can see more of Ms. Richard's art at http://daniellerichard.com.